Suitest can automatically instrument your website or, if necessary, you can make changes manually. At this point you should have configured a browser in your Suitest account. Suitestify is a proxy able to automatically insert the Suitest instrumentation library into your application or website. With Suitestify you do not need to make any physical changes to your app. 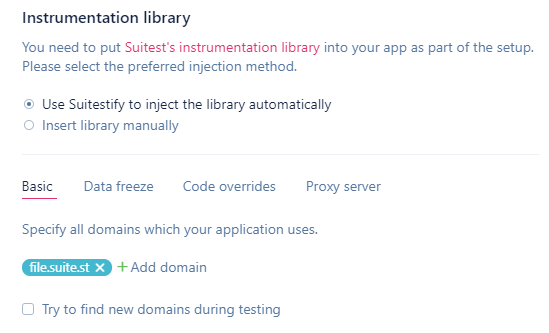 To use Suitestify for instrumentation, select the Use Suitestify to inject the library automatically option, then specify all domain names from which your app is getting its resources. Please note that the app's URL needs to be publicly accessible for Suitestify to work. Save the configuration and try running your app on a device. If everything went well, you should see your app start. On top of your app you should see the Suitest badge. In rare cases if your app starts but appears to be broken, you will need to configure a few more things. You should only fallback to manual instrumentation if you are sure that Suitestify is not suitable for your type of project. Copy and paste the code snippet from the Suitest configuration page into every HTML file of your application. For best results put it as the first script element in your HTML file right after the opening <head> tag. For apps hosted on HTTPS replace http with https in the code snippet above. When inserting the library you must make sure, that you don't accidentally release the app to production with Suitest code in it. Suitest code is intended for testing and could damage the user experience of your app's users.